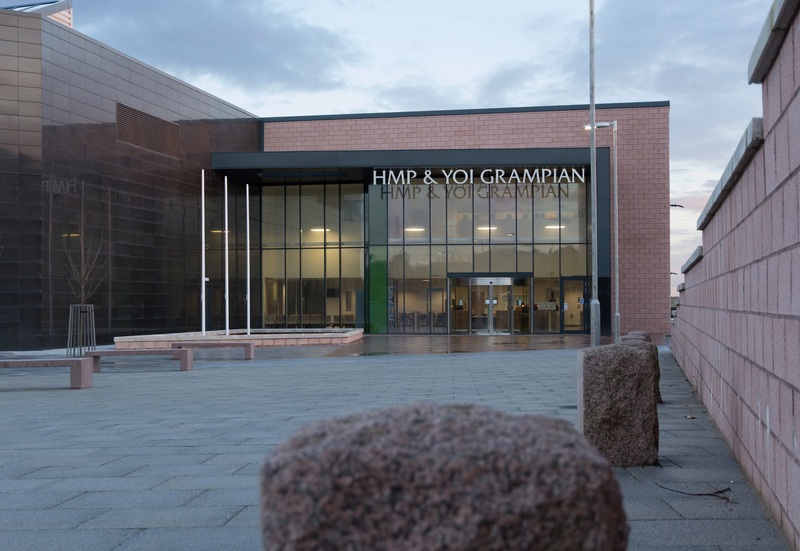 Grampian was opened on 3rd March 2014 and is the first purpose built community facing prison within Scotland, capable of housing over 500 offenders, both male and female, adult and young offenders from the North of Scotland Community Justice Authority. On 4 June 2008, it was announced that HMP Aberdeen and HMP Peterhead were to close and one new prison would be built on part of the old Peterhead site, to be known as HMP & YOI Grampian. HMP Aberdeen 1890 to 2014 known locally known as Craiginches, was sited in the Torry area of Aberdeen, on the banks of the River Dee and was designed to hold 155 offenders. HMP Peterhead 1888 to 2013 was designed to hold 208 offenders and to be Scotland’s only convict prison. In 1911 occupancy averaged at around 350, until peaking at 455. Additional buildings were completed in 1909, 1960 and 1962, bringing the capacity of to 362. Peterhead supplied the labour force to work in Stirlinghill Quarry and the Admiralty Yard. The convicts supported the work of a civilian labour force employed by the Admiralgy to construct the Harbour of Refuge breakwater. At the time of closure in 2013 it has capacity for 142 offenders. Clearance of the site began in February 2012, to prepare land for the building of the new HMP & YOI Grampian. Virtual Visits Virtual visits are possible by booking via the above line. If sending a letter to an offender, put their name, prison number and location, followed by the postal address. · From the A90, take the 4th exit on the McDonalds roundabout. · Almost immediately, take the first left, signposted HMP & YOI Grampian Visitors. · As you drive up South Road, you will see the prison to your right and the entrance to the visitors parking. · From the A982, take the 1st exit on the McDonalds roundabout. · From the A90, take the 2nd exit on the McDonalds roundabout. Stagecoach run regular services from the City of Aberdeen via the Nos 61 and 63 to and from HMP & YOI Grampian, stopping at a bus stop immediately outside of the prison. There is no rail service to the town of Peterhead. The nearest station is Aberdeen which is directly linked to the bus station. All visits are booked by the visitors, through the dedicated visits booking line, with the exception of Exceptional visits. 24 hours’ notice is required for all visits (48 hours for virtual visits), but they can be booked up to 7 days in advance. The visits booking line number is – 01779 485640. If you are unable to keep an appointment , please phone the visits booking line and we can then advise the individual to avoid any undue concern. The visit line is staffed Monday to Friday 10:30 – 11:30, 14:00 - 15:00 and 18:00 - 19:00. Agents visits can be arranged on 01779 485679 or 01779 4855837. The line does not operate between the hours of 1600 to 1730. Drop in agents visits are permitted, but in the interest of expediency you are encouraged to book in advance. Agents are required to carry their Law Society of Scotland ID Cards. Legal Visits by Video Link - Click here for information on the Scottish Legal Aid Board web site for solicitors looking to register for and use video link technology to conduct meetings with their clients in custody. Children’s visits -The focus of these visits is on the engagement and interaction with the children, up to the age of 18, regardless of the relationship to the offender. There are additional standards of conduct and behaviour expected from all those in attendance at these visits. Food and refreshments will be provided consisting of a light snack; i.e. sandwiches, fruit, fruit juice. Exceptional visits – These can been arranged through a Family Contact Officer or the Family Centre & Help Hub. If the offender has never been in custody, these visits would incorporate a familiarisation session for the visitors and include the arrangement of appropriate photographic ID for visitors. Virtual visits - In recognition of the difficulties faced by some visitors, virtual visits are available at Grampian through APEX in Aberdeen. Virtual visits can be booked in the same manner as normal visits. The visits take place in the agents visit area and have a high degree of privacy on the part of the offender, but will be taken in sight of staff. To gain access to the prison for the purpose of visiting you must have two forms of identification, one of which must be photographic ID, or you must have already visited at the establishment and left your details within our system. We regret that we cannot allow entry to the establishment without acceptable identification. Official visitors require Identification cards and Agents are required to carry their Law Society of Scotland ID Cards. Grampian is in the process of building a new family centre and help hub in the car park. You are encouraged to arrive at the establishment a minimum of 15 minutes before the commencement of your visit, this will allow you to enjoy the full visit time. If you arrive after this time, you may not get the full entitlement. If there are spaces on subsequent sessions that day, you may be offered a full visit at a later time. As you enter the prison you will be greeted by staff at the vestibule. You will be asked for your name and who you are visiting. Staff will direct you to place the items that are not permitted within the prison, into the lockers provided. From there you will be asked to walk through a metal detector, whilst any items that you are carrying are passed through a scanning device. If the metal detector indicates positively, staff will guide you through the necessary process, which may entail a search with a hand held metal detector or a rub down search. You will then be asked to take a seat in the waiting room, where vending machine facilities and toilets are available. When your visit is due to commence, staff will ask you to move through to the visit room, en-route, you will be given a final rub down search. The SPS Dog Unit operate within the establishment. The dogs are highly trained and well behaved, but if their presence causes you alarm, please discuss this with the Family Contact Officer. You are permitted to take a maximum of £10 into the visit room, in the form of £1 coins. The visit room has vending machines serving hot and cold drinks and a tea bar. Staff will be as unobtrusive as possible within the visit area; they will however remain vigilant at all times and be supported by CCTV within the area. We have a team of family contact officers; one of them will be available to you at all visit sessions. You can hand in property at the vestibule upon your arrival. Prior to bringing property to the prison, please check that the offender has completed the necessary paperwork, this will save you time and eliminate the risk of the items you bring not being accepted. Property can also be handed out from an offender and this will be given to you by vestibule staff at the end of your visit. You can post property in for a offender by mail to their postal address. Please check that the offender has completed the necessary paperwork and eliminate the risk of the items you send not being allowed in use. You can hand in money at the vestibule upon your arrival, a maximum of £100 per visit. Money can be handed out from an offender and this will be given to you by the vestibule staff at the end of your visit. You can post money in for an offender by mail to their postal address as indicated earlier. We strongly recommend either recorded/special delivery (cost incurred at the post office) when posting cash or you can post a cheque or postal order in. Both of these should be made payable to the Scottish Prison Service, but please add the offenders details on the back of the order or cheque.